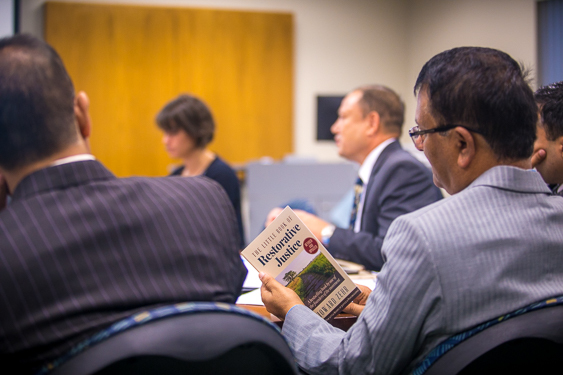 Six experts who are developing curriculum to train Nepali judges and law enforcement officials in restorative justice practices came to Eastern Mennonite University (EMU) on a week-long trip to the United States. During a three-day visit to Harrisonburg, the judges and officials of Nepal’s National Judicial Academy (NJA) in Kathmandu engaged with community practitioners from K-12 schools and in higher education, observed courts in session, visited a re-entry program, and met with personnel working within the criminal justice system. The delegation’s visit was sponsored by The Asia Foundation with support from the United States Agency of International Development. The foundation is engaged in a long-term project to introduce and integrate restorative justice practices into the Nepali criminal justice system through training of judges, prosecutors, lawyers and law enforcement officials, said program officer Ramkanta Tiwari, who escorted the group. The foundation also wants to establish the academy as a resource center for restorative justice in Nepal and in the larger South Asia region, Tiwari added. The delegation, comprised of judges and representatives of Nepal’s National Judicial Academy, plan to develop restorative justice curriculum for the training of judges, judicial officials and law enforcement personnel. Officials from the academy included Keshari Raj Pandit, NJA’s executive director; Bimal Poudel, registrar; and Rajan Kumar, program manager, as well as The Honorable Rajendra Kharel, judge of District Court of Lalitpur and The Honorable Devendra Gopal Shrestha, justice of the Supreme Court of Nepal. Keshari Raj Pandit, NJA executive director, talks with Jordan Detwiler-Michaelson, graduate assistant with the Zehr Institute for Restorative Justice, while Ramkanta Tiwari, program director of The Asia Foundation, looks on. Stauffer was one of the reasons the delegation visited EMU; he had visited Nepal in 2014 with San Francisco-based expert Sujatha Baliga to present and participate at an Asian Foundation-hosted roundtable with judicial representatives from Nepal, India, Sri Lanka and Bangladesh: this reciprocal visit was his chance to share in the hospitality and learning. One aspect of Stauffer’s past professional experience – his 16 years working with transitional justice in Africa, including the South African Truth and Reconciliation Commission – was of particular interest to the delegation. After a decade of conflict between pro-democracy and Maoist supporters, Nepal has begun a peace process that included a transitional justice bill to bring accountability for historic harms. The government also established a Truth and Reconciliation Commission and Commission on Inquiry into Disappearances, which seeks to utilize restorative justice practices on behalf of victims and affected community members. During an introductory circle process with Stauffer, several of the men related how learning about restorative justice had enriched and enlivened their professional engagement. Their goals, they related to Stauffer, were to learn more about how the principles could relate to their specific interests, such as juvenile justice, but also to the criminal justice system as a whole. 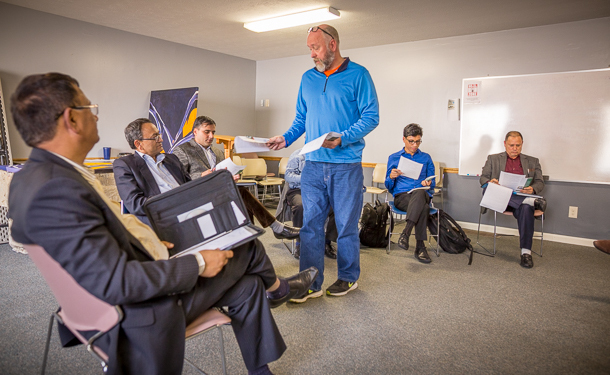 Richi Yowell, program director at Gemeinschaft Home, passes out information to the Nepali delegation about the transitional home for formerly incarcerated men in Harrisonburg. On the final day, the delegation met with various collaborators of Harrisonburg’s community restorative justice initiative at their various worksites. These practitioners included Lieutenant Kurt Boshart, of the Harrisonburg Police Department; Sue Praill, director of restorative justice at the Fairfield Center; and Josh Bacon, associate dean of students/student accountability and restorative practices at James Madison University. A last tour stop was the Gemeinschaft Home, where program director Richi Yowell talked about how the therapeutic transitional home for formerly incarcerated men assists in easing the re-integration process back into society. The delegation was especially interested to learn more about how government agencies collaborate with non-state entities, Tiwari said. Also of interest was the public perception of the restorative justice process, how referrals were made, and what role the facilitators took in the process, he added. 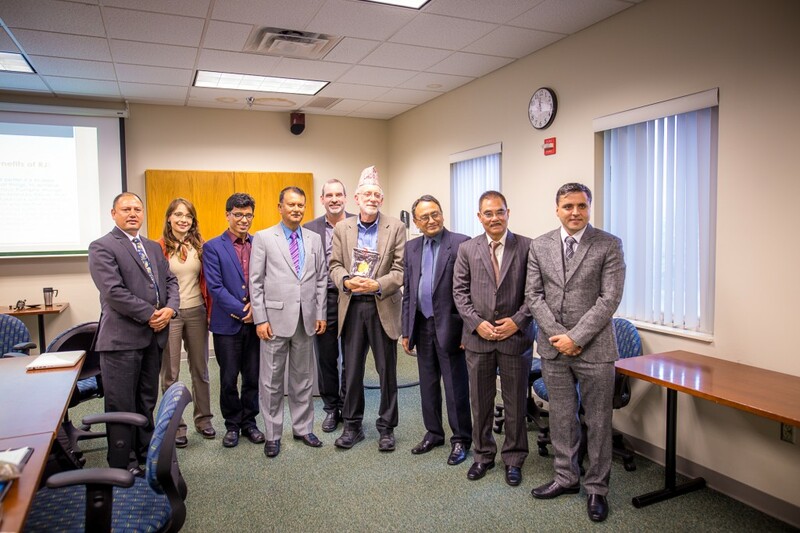 Interest was shown from both parties in the possibility of hosting Nepali judicial officials at EMU for further training in restorative justice practices. “There can be no better place than EMU, especially the Center for Justice and Peacebuilding, when it comes to [learning about] restorative justice,” he said. After visits to Richmond, Baltimore and Washington D.C., the group spent several days in San Francisco before returning home. Editor’s Note: The International Justice Resource Center provides an excellent, sourced summary of the Nepali constitutional process. To learn more about transition justice processes in Nepal and countries around the world, visit The International Center for Transitional Justice. Read more about the peace dialogues in this article about Sujan Rai, who came to EMU’s 2015 Summer Peacebuilding Institute to build her skills and network with other international peacebuilders. The Judges at the Henrico County Juvenile Court in Richmond, VA enjoyed the visit of these Napali Judges! You may bring other visitors and we at the Virginia Center for Restorative Justice will be happy to host them again!